BeadedTail: You've come a long way baby! 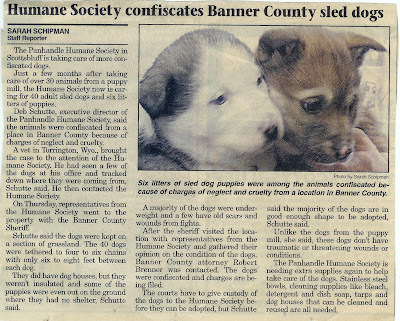 This article from January 2001 tells of the rescue of 40 adult Huskies and six litters of puppies from Banner County, Nebraska. Our dog, Sadie, was one of the puppies rescued by the humane society. She's the brown puppy in the picture. My mom was living in Nebraska at the time and heard the story of these dogs being rescued. She called my husband and me in Colorado and asked if we wanted to adopt one. Well, that was an easy decision, absolutely! Mom was the first one through the door at the humane society the next day to put our name on the list of adopters. Luckily she was first and was persistant in calling them regularly because soon after the court hearing allowing the dogs to be adopted, another raid on a Yorkie puppy mill in NE caused all the Huskies except two to be sent to other shelters throughout the region since the humane society needed room for the newest rescuees. The humane society called my mom and told her we could adopt a puppy, the other puppy pictured was adopted a shelter employee. We were extremely lucky to welcome Sadie into our home and were sad to lose her to cancer on June 22, 2012 but she lived here like royalty and brought us more happiness and smiles than we could ever have imagined! Although Sadie was rescued early and lived the good life with us, we have to speak out on behalf of the animals who are still living in cruel and neglectful conditions. Puppy mills have got to be shut down. Education is the key and once people know the horrible conditions animals are subjected to, it can no longer be swept under the rug. There are many responsible breeders out there but the ones who are not, have got to be stopped. its really good your blogging about this, hopefully you'll educate at least a handful of people on the subject. That's wonderful you got Sadie so early in her life. 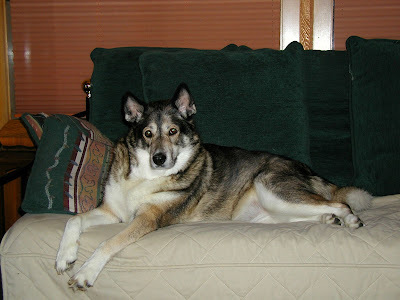 She sure is a beautiful dog and deserves to be treated as royalty! Glad I clicked her picture this morning to read about her story. We didn't know this about Sadie! So glad that you posted the story! So glad that you rescued her away from all that. 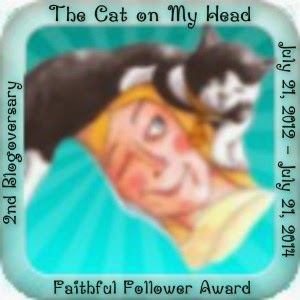 That's what we did with LadyBug too!! The more people we can educate...the better!!! Don't Shop...Adopt!! Khyra's mom sent us over! Happy Mother's Day to you!! 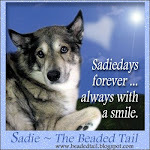 I am glad you were able to rescue Sadie and give her a wonderful life. How nice of you to help raise awareness of animals in need too. Jewelry for the Dog or Cat Moms!